My wife and I were at a party at a friend's place back in February. Maybe a couple dozen people, and we knew many of them already, so we were all talking and laughing and having a good time. At some point, I walked into a room where my wife was chatting with several of our friends about Beyonce's Lemonade album, which had dropped earlier that day. Now me? I'm not much of a Beyonce fan, but I'd been hearing chatter about it online throughout the morning, so I made a point of watching the whole thing that afternoon, knowing many people who would be at the party were Beyonce fans and the album was almost certain to be a topic of discussion. So stepping into this conversation my wife was already involved in, I responded to someone's comment in a way that clearly indicated I had watched it. The discussion stopped for a second as everybody expressed surprise that I'd seen it already -- like I said, it had only dropped earlier that day and I don't exactly fit the mold for Beyonce fans. My wife, who didn't know I had seen it, calmly noted that she wasn't surprised because I was the most woke white guy she knows. (I suppose I should make clear that she's Black.) I take that compliment as something of a point of pride (I would never try to claim that badge for myself and I don't know that I deserve being called woke given how very little racism I've seen first-hand) but, really, that's a sad state of society that a putz like me is more woke than any of the friends and co-workers my wife has known longer than me. The question, then, is how did I get woke? The town I grew up in certainly didn't afford many opportunities to interact with minorities of any sort. It was a small, extremely homogeneous place. The first Black family didn't move in until I was almost in high school. The closest I really interacted with any non-whites was watching Sesame Street when I was younger and The Cosby Show as I got older. So what happened? One of our friends at that party had actually asked me exactly that maybe a year earlier. I didn't have a good answer for him at the time but, on thinking about it, I think a lot of it had to do with Frederick Douglass. See, my father had salvaged most of a set of Golden Legacy comics from a Cleveland school that was going to throw them out. I expect he just thought he was helping to feed my interest in comics and, hey, if they were educational, so much the better. Whatever the case, I did indeed read through all of them and picked up on some things that I hadn't yet learned in school. 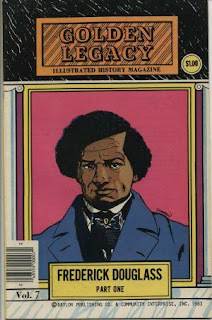 One thing that stood out, however, was the Frederick Douglass' story took up TWO issues instead of the one that everyone else got. They went into a lot more detail, and clearly emphasized Douglass' importance in getting slaves their freedom. As it happened, we were covering about that same period in my history class at the time. And within a week of reading that Douglass biography, sure enough, his name popped up in my history textbook! He was talked about for all of two sentences, and then was never mentioned again. I scanned through the next parts of the textbook looking for other mentions to no avail. Here's someone who I just learned was instrumental in freeing the slaves, and he barely gets a passing mention in our textbook! That experience did two things for me. First, and most obviously, I saw via the biography itself that Blacks could be strong and talented and important people in history. I was certainly aware of talented Black actors and athletes and such, but the notion that they could also be powerful statesmen and history-worthy wasn't something had ever really be said to me before. Second, it forced me to wonder what else we weren't hearing about in school. And how our textbooks might be biased. It made me start to really think critically about what I was learning, and that what we were being fed in class wasn't necessarily accurate. That further means that I brought that skepticism to other venues as well. I tried applying that to watching the news or hearing speakers or reading books and magazines. I'm obviously not always able to get a complete picture of things, but I at least am aware of that and try not to take everything on face value. That includes what the media, politicians, police, and other "authority" figures tell us. So when I first started dating my wife, her experiences filled in many of the holes that I already knew were there. 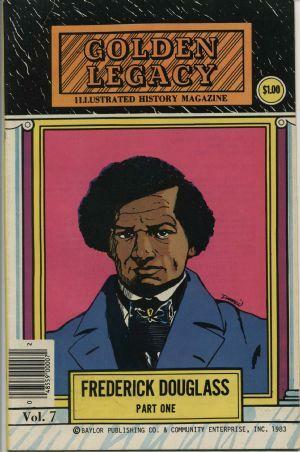 All because of a well-timed Frederick Douglass comic book.